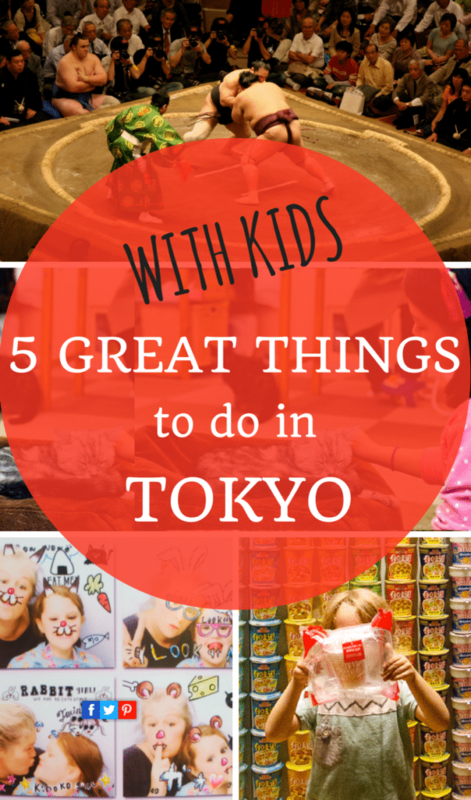 One thing is certain : you will never run out of things to do in Tokyo with kids! I shared our favorite experiences (Odaiba, Yoyogi Park, Ghibli Museum…) in our Tokyo Family Friendly City guide. The bad news is that we couldn’t fit all the things to do in Tokyo with kids in one stay. The good news is that some others family travel bloggers did some we haven’t done! Jason, from an An Epic Education, lived for 13 years in Japan with his kids. He gives very specific and useful tips about how to watch Sumo in Tokyo with kids. “Watching sumo in Tokyo with kids is a blast, and it’s not that difficult or expensive. The Ryogoku Kokugikan (located East side Tokyo) is the place to see a tournament. 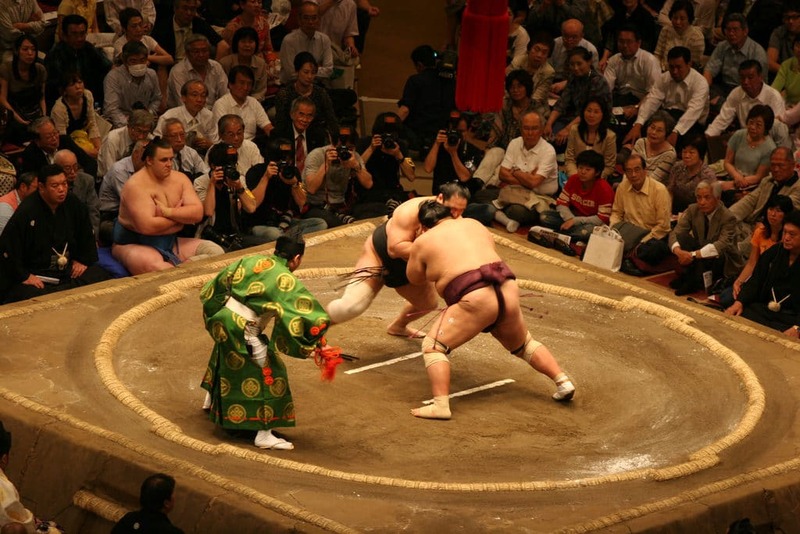 Official sumo wrestling competition (basho) in Tokyo takes place every year in January, May, and September. Each tournament is over two weeks long. It’s much less crowded on a weekday, in the middle of the tournament. – First floor seats: a cramped square of tatami mats for four people at over USD $100 a person. You will be close, but sitting on tatami mats with no seat back. Besides being pricey, it is quite uncomfortable after a while. I never got used to it! – Second floor seats: individual seats for around USD $35. You can buy tickets at the stadium or online here. – Arena-style general admission seats: “free” seating at the very row top, the place we usually sit! They are USD $19 for adults, 2 USD for kids and under 4 are free. On sale at 7am every day of the tournament — no pre-sale. To acquire these tickets, you need to be there much earlier (meaning really early, 6 am). 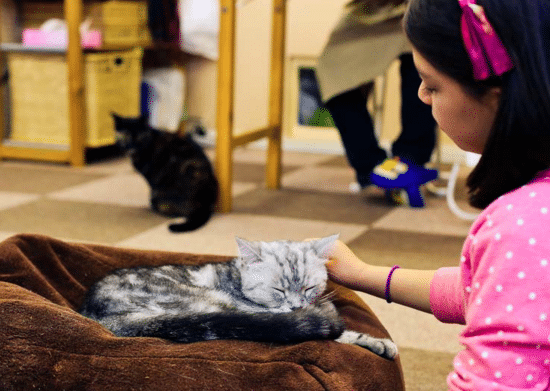 “It’s not easy to fin a cat cafe with kids in tow. Many places have a restriction saying you need to be 12+ (these places are worried about overly rambunctious children terrorising their beloved kitties). We chose Cat Cafe Nekorobi which is a small cat cafe with about 14 cats on their roster. We went early afternoon (post lunch-time) and were there with only a few other Japanese people. Some of the cats were sleeping and others did not want to be bothered. There were enough cats though that wanted to play and be cuddled to make the experience completely entertaining. We each quickly found our favourites: my daughter and I loved the one that we called Grumpy Cat, my son liked the dumb kitten who would chase his own tail and always wanted to play. There are two small sofas as well as a table and chairs if you just want to sit. Wifi is free and excellent as is the vending machine providing drinks. Although you are only a couple of floors above street level on a busy Tokyo street, the atmosphere is quiet and chilled. There are about 30 cat cafes in Tokyo, but there are also other types of animal cafes for rabbits, birds, owls, snakes, reptiles, dogs and even penguins. Basically most types of pets are covered by some sort of café! Nekorobi Cat Café is in Ikebukuro neighbourhood of Tokyo. Subway Stop: Higashi-Ikebukuro. 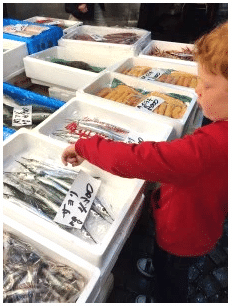 “The fish markets are a must for your visit to Tokyo. We didn’t go to the 5.30am tuna auctions but instead headed to the markets at 10am. There was still lots of action as the markets were coming to an end for the day. It wasn’t busy and we were able to wonder through the stalls and look at the strange offerings from under the sea. 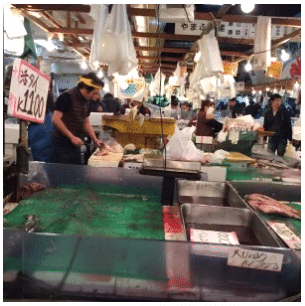 Tsukiji Fish Market area is definitely the place to have the best and freshest sushis in the world! 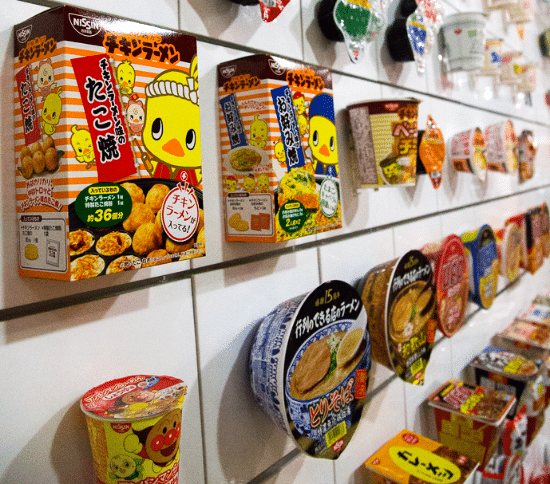 Maria, from One Tiny Leap, tells us about a weird and funny Museum : the Cup Noodles Museum, in Yokohama. “The creator of Cup Noodles, (otherwise known as instant ramen) decided to develop this type of food as an effective and affordable means to end world hunger, and as space food. Actually, it’s a staple food of student halls all over the world and a popular phenomenon in Japan and other Asian countries. The Cup Noodle Museum is a space dedicated to the history of dehydrated noodles, with its own mini-factory area where you get to create your own mix of cup noodle, and even decorate your pot!The story of how the ubiquitous instant noodles came to conquer the world is fascinating and the museum does a great job of introducing you to how they came about. It’s great fun to explore how the packaging has changed throughout the years, all the way from 1957 when the first Chicken Ramen was invented! Then it’s time to make your own Cup Noodle! Step 1: learn about the ingredients, step 2 decorate your cup, step 3 choose 4 dry ingredients and a flavoured broth, step 4 seal the cup, put it in a souvenir bag and take the mandatory photo! Note : Yokohama is a city in the Tokyo suburbs, easily reachable (how to get to the Cup Noodle Museum). And Bron, from Smiths Holiday Road, visited Tokyo with her three kids aged 11,7,4. Among all the fun things to do in Tokyo with kids, they loved to experience “Puri Kura”! 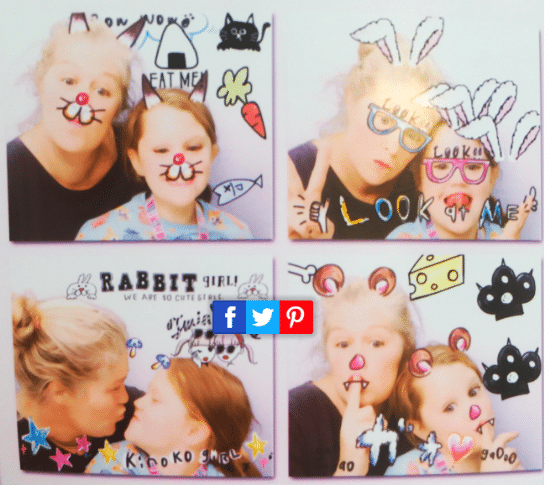 Let’s discover what it is: “The Japanese photo booths are so much fun! They can be found in game centres (loud and busy but not as noisy as the adult game of Pachinko!) and are big machine crowded with teens and couples taking fun photos! We loved testing them out and it’s a great thing for kids and big kids! I especially loved the child like complexion it gave me! At last, I have also heard about a Ninja Trick House where you can train like a Ninja! Unfortunately, I couldn’t find yet any family sharing this visit. 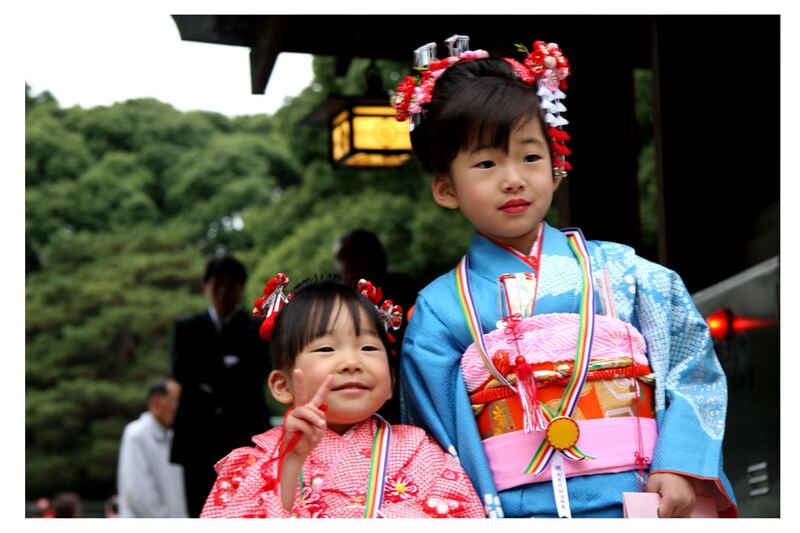 All this things to do in Tokyo with kids seems really exciting! Have you, or would you like to experience some of these activities? Great post. I haven’t been to Toyko for over 20 years and have never been with my kids. Thanks Dana 🙂 Tokyo is really an amazing place to visit with kids! Hi Virginie, thanks for sharing. What a great round up! My husband would love to visit Tokyo and it is high on our list. We always travel with the kids (they are 10 and 12 now) and they love exploring the world! Thanks Natalie 🙂 Keep it high on your list, worth it! ← New Year’s With Kids: the best places… and the others!